Letting our most childish reviewers take over for this review (and we actually do mean the kids this time), we're taking a look at a toy for very young kids - as young as one, in fact. Grab your helmets, unwind those hose pipes, and join us as we check out the VTech Toot-Toot Drivers Fire Station. This expansive play-set from VTech has been designed for kids as little as one year old, and takes the form of a fire station with connecting and modular ramps and slides, along which the included fire engine toy (and others, sold separately) can be driven. It requires parental assembly and features electronic elements - the batteries for which were included. Score. 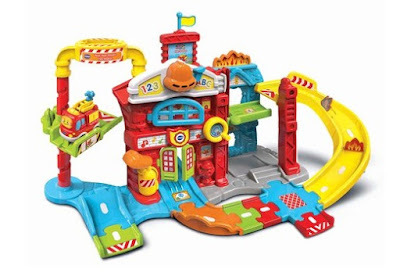 Once set up by clicking the ramp sections together, the VTech Toot-Toot Drivers Fire Station was ready for the wee ones to play with. 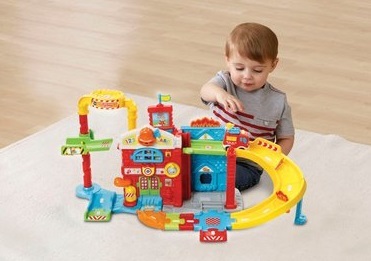 It is a very hands-on toy, as the point of this thing is to push the fire engine around the tracks, wind it up the couple of rising platforms, and let it roll down the slides. There is a crank-handle on one side of the fire house to life the engine to the top level, and also a spinning 'fireman's pole'-like platform to get it down in a hurry. The electronic features aren't as annoying as we thought they might be, as they are not set in random buttons for little hands to constantly slap. Instead, sensors are set into the track of several sections of the play-set, and when the vehicle is run over them, they chirp up. The sensors detect what kind of vehicle is passing over, so you get specific noises for the fire engine; ones you wouldn't get if a different VTech SmartPoint car was to drive by. 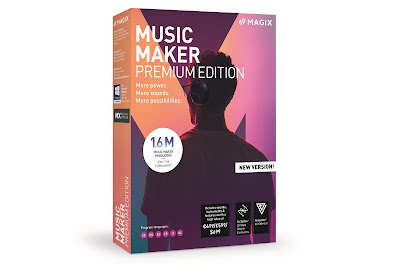 This means, however, that only that specific toy will make the pre-programmed sounds, and as parents prone to being bothered by constant sounds, we thank VTech for that. Once the kids got the feel for the VTech Toot-Toot Drivers Fire Station they loved it. It was at first a bit of a surprise as to why only the fire engine made sounds while on the set, and not all the other random cars and trucks they found to drive about on it, but the real draw was the ramps and slides. For the littlest hands in our tester crew, the chunky parts and bright colours were enthusiastically received, and the whole thing was played with for hours. 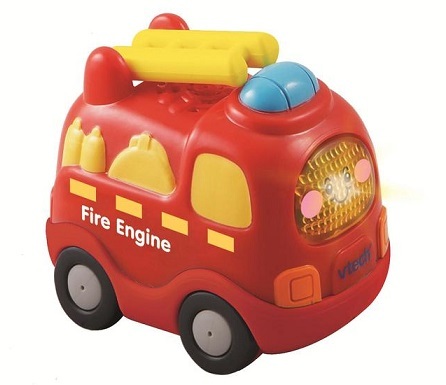 Able to connect and expand with play-sets from the VTech Toot-Toots Drivers range, the Fire Station got several small yet significant thumbs up from our testers, and is now a treasured centre-piece of the playroom.